A child Is the greatest creation of nature . The teachers job is to nurture and help it develop into a strong balanced and happy personality. A set of rules and regulations were informed. Our institution is not just another school . It is a nurturing ground for our little children where they develop into holistic individuals , emotionally , socially , physically and mentally. To take their first step forward towards the academic world, K.R. 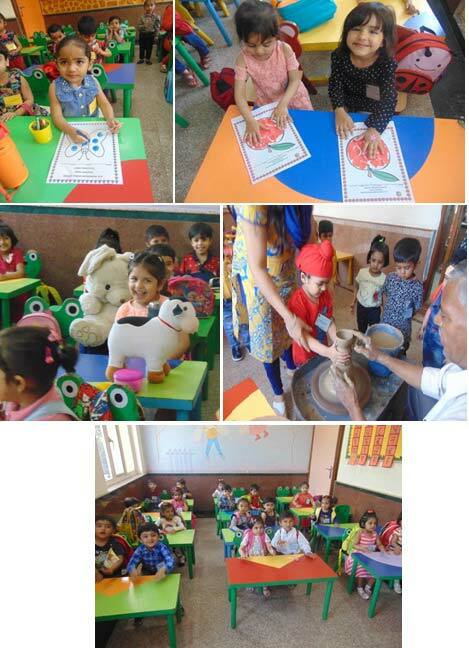 Mangalam World School, Paschim Vihar organized a four days orientation programme for them with the aim to provide these tiny tots an environment free of stress and cultivate their love for learning. Every morning brightened up their joy when they were welcomed and received with a bounding love by the pre-primary In charge, teachers and all the staff with a gift. Each day was planned with various fun-filled and creative activities like colouring, hand printing, tearing and pasting, music and dance. These activities not only boosted their fine motor skills and also motivated them to explore and learn more. Stories were narrated to them with the help of the props, puppets and interactive board. They were made the little chefs as they were encouraged to make jam & chocolate sandwiches in various shapes. Each day nutritious snacks and fruit juices were served to them which they relished a lot. To accustom them with the school environment, these tiny tots were shown magic show & cartoon movie in the school premises which extended their joy to its extreme. To rejoice with the happiness of the children, a day out was organized for them. They went to Mc Donald’s, where they relished burgers, French fries and fruit juice. Their sense of adaptability and belongingness in K.R. Mangalam family was acknowledged with happiness as they carried along an attractive gift each day while going home. Thus the mission to instill in them the joy of learning in new environment was accomplished.